This is a simple test. It will will show the level of your vocabulary in one minute. You will read 25 words. 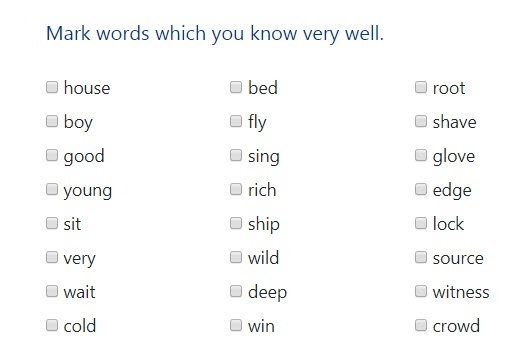 Count for yourself how many of these words you know. If you know 0-1000 words, you can read news for Level 1. If you know 1000-2000 words, you can read news for Level 2. If you know 2000-3000 words, you can read news for Level 3. If you know more than 3000 words, your English is probably good enough to read jokes in their original versions. Jokes at Jokes in Levels are adapted for students who learn English as a second language. The highest level we have is 3000 words. When you start to read jokes at your level, it can be difficult for you at the beginning. If you use Jokes in Levels every day, you will understand more and more. If you want to know more about levels, please click Levels.